From Conference Report titled "Attendance at 14th Ka and Broadband Communications Conference, IAC2008 and SPSC2008"
"Attendance at 14th Ka and Broadband Communications Conference, IAC2008 and SPSC2008"
This is a report on attendance at the 14th Ka & Broadband Com. 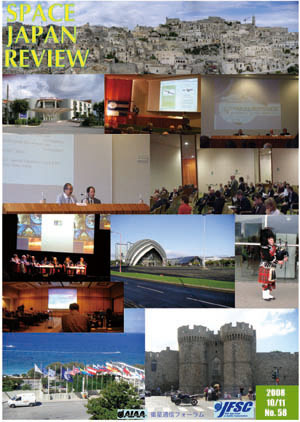 Conf., held in Matera, Italy, IAC2008, Glasgow, U.K. and ESA SPSC2008, Rhodes Is., Greece for almost three weeks from the end of September to the beginning of October 2008. "Contribution to digital divide free communication society" is one of the development purposes of WINDS so that it can offer possible Internet communication environment in anywhere since Internet already becomes one part of life. Mr. Masaaki Shimada, Senior Engineer, Aerospace Research and Development Directorate of Japan Aerospace Exploration Agency (JAXA) talks his successful career on the developments of experimental communication satellites including the WINDS satellite.